Learn how GoSquared goes the extra mile to protect your data and privacy. The European Union’s General Data Protection Regulation (GDPR) protects the fundamental right to privacy and the protection of personal data for people in the European Union. GoSquared services comply with the GDPR. Protecting our customers’ information and their users’ data is our number one priority at GoSquared. As a data controller and processor we continuously work to ensure our ongoing compliance with the GDPR. We're always working to innovate our products and practices so we can help our customers respect the privacy of their own customers, and to fulfil their own requirements for data privacy laws around the world, including the GDPR. CompleteObtain Cyber Essentials Security certification. CompleteThoroughly research the areas of our product and business impacted by GDPR. CompleteAppoint a Data Protection Officer. CompleteDevelop a strategy and guidelines for how to address the areas of our product impacted by GDPR. CompletePerform necessary changes to the platform. CompleteEvolve our internal processes and procedures. CompleteThoroughly test all changes under the GDPR. CompleteRewrite our Data Processing Agreement. CompleteObtain independent GDPR compliance certification. We've introduced an update to our Deletion API with the option to "blacklist" a profile from the GoSquared Customer Data Hub. This enables our customers to respond to user requests to permanently delete personal information, such as names and email addresses, from their GoSquared account. The update to the Deletion API also prevents the profile from being sent to any third party services connected to GoSquared, as well as preventing the profile from being re-tracked and re-appearing in GoSquared. By default, GoSquared Analytics anonymises the IP addresses of your website visitors. Learn more about the anonymizeIP option in the tracking code. GoSquared will still track an IP address for each visitor, but with much less precision. This means that a visitor's geolocation will be less precise – a good thing for protecting a visitor's anonymity. For example, you may only see country-level location information – rather than city-level. Under the GDPR legislation, customers of GoSquared can request an export of all personally identifiable information associated with their account. To request a data export, please contact dpo@gosquared.com. Is GoSquared compliant with the GDPR? Based on our self-assessment, that of our Data Protection Officer, and that of the independent accreditation body IASME, we are fully compliant with the GDPR. 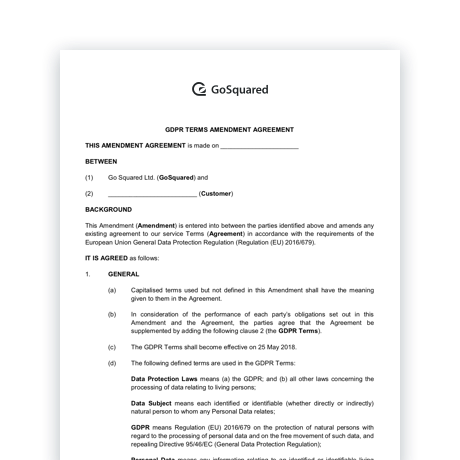 Does GoSquared have a Data Processing Agreement (DPA) we can sign? Do you market other products or services to the contacts we add to the GoSquared platform? Where does GoSquared store its data? Our infrastructure is powered by Amazon Web Services (AWS) who take security and compliance very seriously. Our services are hosted in AWS' US East region. If we were to ask you to remove all personally identifiable information we have provided you on a customer or team-member would you be able to do that in a timely fashion? Yes – please email dpo@gosquared.com. Does GoSquared have any certification for data protection? 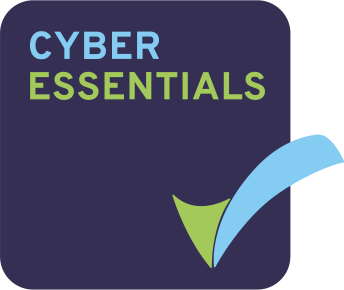 We've successfully completed the Cyber Essentials certification to identify the fundamental technical security controls needed to defend against internet-borne threats. We have also been certified by IASME as compliant with the GDPR. As an organisation, we're committed to making sure our users and customers feel safe and secure using our platform. This page is frequently updated to reflect privacy and GDPR-related information and updates that we're making to the GoSquared platform. If you have any further questions please don't hesitate to get in touch with us on GoSquared Live Chat or by emailing us on dpo@gosquared.com. A handy checklist to ensure you're compliant. 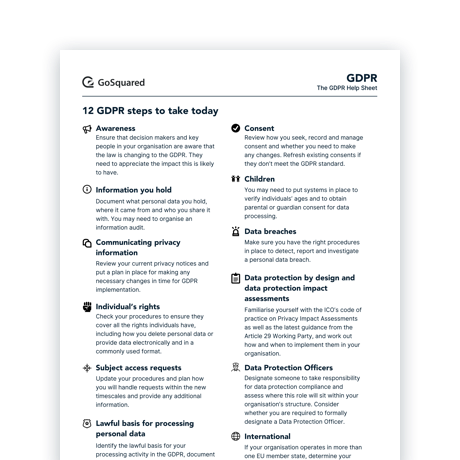 Find out how GoSquared helps you with GDPR compliance.